Heavy duty load binder uses a ratcheting action to tighten chain tie downs. Designed with a forged steel handle for maximum leverage, and a cam and pawl mechanism that creates a smooth, easy motion. Stamped with the size, break strength, and working load limit on the handle. 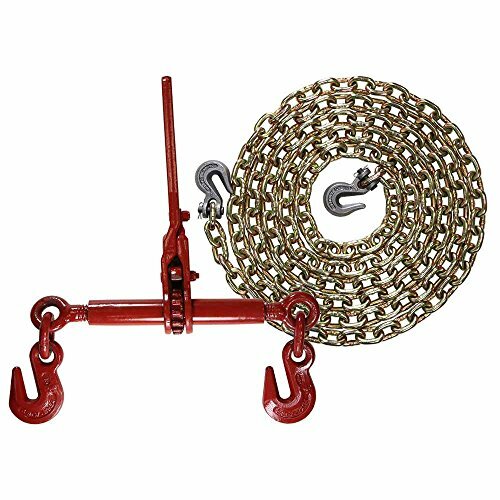 Standard link grade 70 carbon steel chain is manufactured by Columbus McKinnon in the USA and assembled with clevis grab hooks on each end of the 16 foot length. Finished in yellow zinc chromate for protection from the elements and for quick visual identification as grade 70 chain. Embossed in one-foot increments with proper grade 70 markings. Manufactured in a high-strength, low-alloy carbon steel for long-lasting quality; strength-tested and heat-treated for maximum safety and durability. Binder and chain meet NACM and ASTM standards.